Perception and Reality – What is the difference? Over 20 years ago at about noon on the first day of the 2-day Leadership Team Advance, we returned personal profiles created from peer input of the executive team of a Northwest timber company. After reading over the feedback, the Vice President of Operations began to tell us how people’s perceptions of him were wrong. Perception is how we perceive things; reality is how things are. There may never be a perfect match. Your perceptions are limited, tainted, colored by fear, biases and prejudices. The more pure-hearted, the freer of fear we become, the greater the alignment between perception and reality. This raises the question - Can a person be wrong about their perceptions? The answer - of course “not!” Why? Because it is their perception, they own it. You and I possess our perception, they are our own. Are the other persons’ perceptions an accurate representation of reality? We know not. All we can know for sure is that their perception will match or fail to match our perception of reality, how we had hoped to be seen, how we would like to be seen. You have self-perceptions, some of which could be delusional. Maturity is seeing ourselves accurately. There is often a gap, sometimes a chasm between reality and our self-concepts. Accurate self-appraisal can only happen if we give up fear and the need to be liked, accepted, understood and admired. We replace this unhealthy need with the desire to understand, to see clearly, to know the truth. When you accept yourself for who you are – warts, foibles, mistakes, shortcomings and weaknesses – this doesn’t make you complacent; it empowers you to action. Rather than it making you weak, this humility gives you the strength to act with insight, courage, decisiveness and determination. You can begin again to create the you you wish to be, the leader you have always wanted to become. 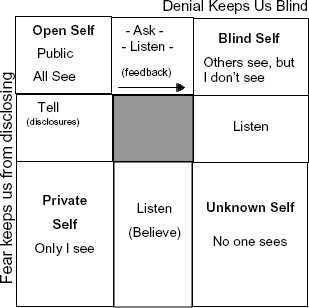 The Johari Window is an important “quadrant” model named after its two inventors, Joseph Luft and Harry Ingham (“Jo-Hari”), for describing, evaluating and predicting aspects of interpersonal communication. There are four panes (quadrants) and divides “personal awareness” into four different classes; Open, Hidden, Blind and Unknown. The lines dividing the four panes are like window shades, which can move as an interaction progresses. Through the panes we present and receive information about ourselves and others. The data flows are dynamic. The model allows us to see movement from one “pane” to another as trust ebbs and flows. Use this model on your path to a more accurate self-appraisal and tap more of your unknown potential.